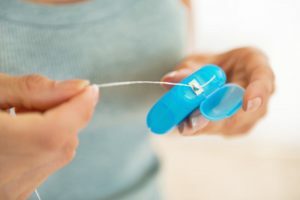 Dental Floss: Why Is It Important? Taking proper care of our teeth is a crucial part of our lives. As such the small tasks such as brushing and using floss daily is what makes our natural teeth not only healthier but last longer. Why is floss important in our lives? Using dental floss allows to clean thoroughly between our teeth. It is an added benefit that is often overlooked and not taken too seriously. You see, a brush helps immensely by brushing the dent surface of our teeth, eliminating the plaque and food within its reach. For this reason, it has a tough time effectively removing the food particles and bacteria in-between, as the gap is too little and hard to hit precisely. Is it more important than brushing your teeth? This is a question we get asked a lot in Los Algodones. It is not a matter of one task being more important than the other, think of it like each complementing the other! Through brushing we clean the surface and back of our teeth and through floss we clean the narrow spaces in-between. We can’t have brushing without flossing, and flossing without brushing. From the many types of dental floss there are, you should start with either a nylon or monofilament one. Those two have some differences. For example, a nylon floss can be waxed or unwaxed, but it has the chance to snap if used too harshly. On the other hand, a monofilament one is more sturdy and easier to handle, but it is more costly. As such there are also some special types you can get. For example, there is one that changes colors depending on the amount of plaque removed. Likewise there are mint-flavored ones to help children stick with flossing. How do you correctly use dental floss? Start by ripping a piece of about 16 to 20 inches. Wrap each end around one finger in each of your hands. This is to make it easier to transition as you floss, make sure it is not tight. Proceed to move the thread gently between your teeth. Go through each one including the ones in the back row. Do not reuse areas of the floss that you have previously used. This can help the bacteria and plaque to move around. Angle the thread into a “C” shape in order to get most of the tooth as you can. There many benefits that come from flossing. It removes plaque, bacteria and food residues from your teeth. Helps against the development of gum disease. 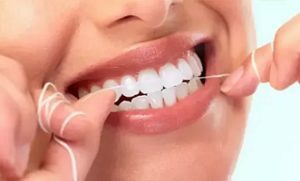 A good session of flossing helps keeping your teeth and gums clean. Thanks to this, it frees up all the buildup plaque where gum disease usually develops from. Cleans your teeth to give a better first impression. Having food stuck between our teeth is a very common situation, and most of the time we do not notice it. With the help of dental floss, it is easy to deal with those scenarios a 100% of the time. No Replies to "Dental Floss: Why Is It Important?"